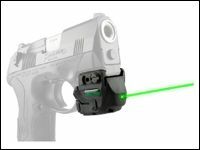 Rochester, N.Y. – LaserMax announced the debut of GENESISTM, a compact, durable green laser with a rechargeable battery. The highly visible, pulsating green laser from LaserMax comes equipped with an easy-access universal micro USB port which makes charging fast and effortless. Weighing in at a mere 1.4 ounces, GENESIS fits on virtually any firearm with an accessory rail. A dual tapon activation accommodates both left and right-handed shooters. Additionally, the GENESIS has an automatic 10 minute shut off that ensures every charge lasts. GENESIS also has an optional momentary activation switch, ideal for long guns. Like other high quality rail mounted lasers from LaserMax, GENESIS is user adjustable for windage and elevation. LaserMax is a leading innovator and manufacturer of high quality laser sight systems. For more than 20 years, the company has provided laser products for military, law enforcement agencies and commercial markets worldwide. LaserMax additionally delivers the most advanced laser products and optical systems for semiconductor, aerospace, biomedical applications, and telecommunications. LaserMax is a WBENC-certified and ISO 9001:2008 small business. All products are designed and manufactured in a state-of-the-art facility in Rochester, New York, USA.